Shopping cart abandonment: when a potential customer starts a checkout process for an online order, but drops off from the process before completing the purchase. Any item that enters the shopping cart but never makes it through the transaction is considered to be “abandoned” by the shopper. A shopping cart abandonment rate is calculated by dividing the total number of completed transactions by the total number of transactions that were initiated. This rate will identify what percentage of a site’s users signal purchase intent by adding an item to the cart, but don’t complete the purchase. The shopping cart abandonment rate is an important metric for e-commerce sites to keep track of because a high abandonment rate could signal a poor user experience or broken sales funnel. 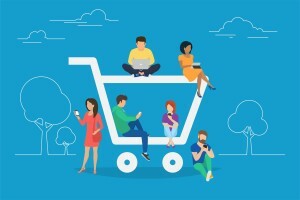 Reducing shopping cart abandonment leads directly to more sales and revenue, so optimizing the checkout flow a core area of focus for many online retailers. Why Do Users Abandon Their E-Commerce Carts? Clients know that if users create an account they are more likely to place a repeat order, making it easier to maintain a relationship with them. Let’s be honest; those are two good reasons. So how can we give clients what they want, without damaging the user experience and increasing cart abandonment? A guest checkout option! If that is not an option for you, ensure that creating an account on your site requires nothing more than picking a password once the user has finished making a purchase. After all, you have collected their email, shipping address, and other details. We discuss this aspect in depth in our article on Single Page Checkouts vs Multi Page Checkouts (LINK). E-commerce site owners love to add fields to their checkout process. Their reasoning? The more site owners know about users, the easier it is to persuade them. What they fail to consider is the cost of adding ‘one more field’. Revisit your checkout strategy and see if your preference is adding value or causing damage. Never, ever, ever hide costs from the user! People presume a site is being manipulative when it hides the delivery cost before checkout. We think it wants to make the product appear cheaper than it is. However, that is often not the case. Often it is because it’s hard to show delivery until the user has selected a product and provided an address. If this is the case for you – why not ask the user at an earlier stage what location they are in – and give the m a ballpark figure of delivery costs. Nobody wants to be hit with a R200 delivery charge only once their order is processed, only to find out you offer free delivery for an amount a few rands short of their purchase! Payment security is the first cart abandonment reason that has a major disproportion between its probability and impact rating. When you are concerned about security – moreover, financial security – it has a dramatic effect and immediately instils doubt. Major causes for suspicion include design flaws, out-dated layouts, missing images, and no SSL certificate. The easiest way to mitigate this is through various forms of social proof to assure customers that you are a trustworthy store. Use customer testimonials. Use product reviews. Use endorsements. Provide full contact information, such as a phone number and even faces and bios of you and your workers. Web Errors, Slow Response Time and –gasp- Crashes! Website errors, crashes, and load times are major deterrents to completing purchase, and contribute to a sense of insecurity on the site. Focusing on the customer experience is vital. Make sure that you are regularly going through your site, from home page to checkout, ensuring that your site is still up to date and there are no issues. You should perform these checks across a variety of screen sizes, especially as mobile continues to grow in importance. You can check site speed through a number of free services; try to do this either weekly or bi-weekly. Simplify and shorten your checkout process. Show all costs (or at the very least, close estimates) from the get-go. SSL. HTTPS. Make it happen. If you don’t have a guest checkout option, get one. Build trust through visible trust badges and social proof. In conclusion, if you make the user experience more fun and seamless, assure them and offer trust, and ensure there are no issues in making payment (that they know the total cost of upfront) – you are on the right path to fewer cart abandonments, and possible even more new customers. This entry was posted in Cart Abandonment, E-commerce. Bookmark the permalink.